Looking for a full suite of whole blood Hematology controls and calibrators for hospitals and clinical laboratories? If so, please visit R&D Systems for a full range of products available to meet your needs! 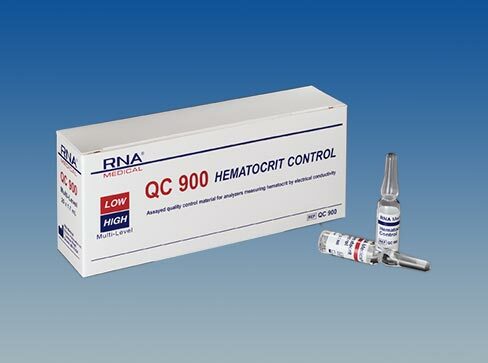 QC 900 is an unassayed quality control material for analyzers measuring hematocrit by electrical conductivity methodologies. It is available in two (2) levels for monitoring analyzer performance at varying points within the clinical range. RNA Medical, PeerQC, and Safe-Wrap are a registered trademarks of Bionostics, Inc., Devens, MA, USA. DCA and DCA Vantage are registered trademarks of Siemens Medical Solutions Diagnostics Corporation, IL, USA.